Right ISBN but a different cover. Big Stone Gap is a sleepy hamlet where kids get married and start families at eighteen, and stay for ever. So thirty-five-year old Ave Maria Mulligan is something of an oddity. A self-proclaimed spinster, as the local pharmacist she's been keeping the townsfolk's secrets for years. Now Ave Maria is about to discover a scandal in her own family's past that will blow the lid right off her quiet, uneventful life. Soon she's juggling two unexpected marriage proposals and conducting a no-holds-barred family feud. 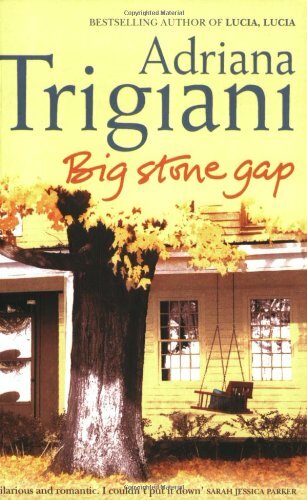 The thought of spending the rest of her life in Big Stone Gap is suddenly overwhelming...With an unforgettable cast of characters and a heroine with an extraordinary story to tell, all living in this quirky, remarkable town where even Elizabeth Taylor pays a visit, BIG STONE GAP is a wonderfully vibrant, unashamedly feel-good debut. Offered this as a book ray. Just a couple of takers as listed. The last person to have the book is free to do whatever they want with it. I hope you enjoy it and if you want to read more of the series I will be offering them later. Thanks PurpleRosebud. I look forward to reading this. Horror of horrors! Look how long I've had this. So sorry. I am now sending it on to tregossip. Had a senior moment and forgotten I'd signed up to this one. Such a sado I bought a copy yesterday (different front cover)from Cornwall Cancer Care charity shop. I'll read this one and send my copy into the big blue yonder as a wild release.